Singlewire’s InformaCast Advanced Notification software helps organizations create a streamlined system for mass notification, emergency communication and IP phone paging via Cisco phones. "Powerfull mass communication one you have it set up"
Informacast integrates with our phone system to notify administrators and other key staff when 911 is dialed, and provides them with the building, room #, extension, and caller name so we can respond quickly. We programmed a single button on each phone which opens up a building-wide announcement to all phones and overhead speakers so that they can describe the exact situation of an emergency to allow others to take action. It is extremely simple for end users- simply push one button and talk. No codes to remember or dial, which would likely be forgotten in an emergency. Clearly define the exact notifications that you wish to enable, and the exact conditions which will trigger each notification. You can configure Informacast to add recipients later, but the initial triggers likely require a vendor or consultant to configure, so you should only do them once. Our school district was looking for a method to allow anyone to quickly provide real-time information to everyone in a building during rapidly-evolving emergency situations. Informacast provided a way to program a single button on each phone which broadcasts a live announcement from that phone to all (or some, as you configure it) phones and overhead speakers. We linked it to both our legacy analog paging systems, as well as new Advanced Network IP speaker/signs. Secondly, we needed to notify key staff of emergencies and 911 calls. Informacast now sends alerts to specific staff (depending on the origin of the 911 call) via SMS, phone call, and alerts via the Informacast mobile app. The alerts notify us of the building and room from which the call originated, plus the extension # and assigned user. This allows us to respond quickly. "Quick to implement, Easy to use"
This product was a lot less expensive than the software we were using and it has more features than what we had. It was easy for us to export users out of our old software and modify the data a bit and upload into Informacast. It took us less than a day to implement Informacast! Informacast support is beyond great, they know what they are doing and have worked with the solution for a while. We use informacast under a big umbrella, so many divisions use it. I wish there was a way to separate the divisions out a big more. We do have the segregated pretty well, but it would be even better if it was split up a bit more. We use informacast a lot for weather alerts. We do use it a bit to update users on different shifts. Now that it has been going so well we are looking at purchasing our own server with Informacast for real time updates sent to IP phones, which will be another great addition. What Emergency Notification solution do you use? "Straight forward IP paging solution for businesses of any size"
Informacast provides a centrally managed IP paging solution that grows with your network. It is simple to deploy and easy to manage. It utilizes your existing network through multicasting. It comes with a suite of troubleshooting tools and well documented guides including how-to videos. Licensing is flexible and can be re-balanced between IP phone or speaker end points. Informacast also has integration into legacy paging systems. The support staff is very responsive and resolves most of my issues within 24 hours. There are some gaps between Informacast and its IP speaker vendors. Even though the speaker hardware is a separate entity from Singlewire, it would be nice to get more direction on recommended hardware instead of a cold reference to the hardware vendor. Lack of backup solution. Centralized paging also means no paging when the network is down. Multicast routing can be difficult to setup and troubleshoot but once it's setup the software works as designed. Make sure you have a clear understanding of multicast routing in your current network. Migrating to Informacast eliminated the problem of a disjointed paging solution across our 300+ locations. It allows us to have a single platform for paging management and troubleshooting. Remote sites can benefit from paging without any local server or paging modules. "InformaCast in a Public School District"
We deployed InformaCast as part of a VOIP phone system upgrade because InformaCast would allow us to use our Cisco phones as devices for initiating notifications and as paging devices. Through InformaCast, we are able to initiate emergency notifications to our endpoint Cisco VOIP phones and also to IP clock/speaker devices that we bought for each classroom. InformaCast also helps us to manage all of our IP clock/speakers in the district, and we use those IP clock/speaker devices as bells for scheduling student movements. Customer support has always been easy to work with and quick to answer my questions. We are really happy with the way that this product works! I feel like InformaCast could be doing more to develop plugins for their product that would allow it to do more/integrate with other platforms. Having said this, I must admit that I haven't made those plugins and their use a priority for investigation. We are happy with the way that the system works, and we would probably find that the plugins, once the bugs are worked out, would work well, too. Customer service at InformaCast has always been very helpful. We use InformaCast primarily for paging, bells, and emergency alerts across our buildings on campus. "Great software, integrates flawlessly, with excellent stateside support." I came onboard at my hospital with zero experience with integrated paging software, but upon contacting Singlewire, they walked me through everything. I can't say enough how satisfied I am with them. Really nothing - I suppose being integrated as part of the CUCM appliance would be the only thing I could ask for. Also, the only difficulties I've truly ever run into is when a telco circuit does not provide multicast. If you don't have multicast enabled between your server and end device, on every circuit, Informacast will not work. I highly recommend Informacast. Their product is excellent and their staff is very personable and helpful, and very accessible. We have solved communication and safety issues. Being able to create user groups of phones in our offsites allows us to enable paging without pricey old-school PA systems. I love the support and documentation most of all. The application is, of course, rock solid and versatile but that wouldn't matter if I couldn't find how to implement a new feature or get help when we are stuck. Our account rep has always been responsive and supportive of any issues we have had and Singlewire's TAC is responsive, knowledgeable, and very friendly. There is a particular limitation within the software that prevents the granular access we need for our very large environment. Since Singlewire keeps InformaCast in line with Cisco's upgrade path they only receive upgrades every 6-8 months which means you simply need to hope for the feature you've requested to be implemented. Be sure to reach the admin guide. It has answers to many of the questions you will have and don't be afraid to reach out to TAC. Everyone is very friendly and efficient. On site alerting for our many colleges is the primary use. Example alerts are lockdown, lockout, or panic buttons. "Excellent product with features I am still learning"
The feature set this product offers is more than I have even figured out as of yet. Each time we are looking to do something, this product suite can usually have a form of integration. We tie into our PA system, our panic system, our 911 dialing, our messaging systems. We run it as a VM on VSphere and it just works. Updates are easy to install and the install instructions are usually spot on. Great product! Nothing as of yet. Support is on game and the product is great as well. The product is solid and encompasses so many options. It would be difficult to find another resource that offers even part of what this product offers. We originally used for a tie into our PA and 911 notification. External messaging capability in an even of an emergency. Learning that we can do so much more with the product. Truly a remarkable product. "A powerful tool for alerts/messages without complication"
Seamless integration with Cisco Call Manager and plenty of documentation to do it right. Highly customizable: messages with plenty of options per your convenience; plus, plugins that can help you extend functionality in many ways. Being able to check the results of a message you sent with confirmation statistics and feedback responses; you can send a quick poll to people! Excellent technical support when things don't work as you expected. I was able to solve a problem satisfactorily in a short period of time thanks to the recommendations of the tech support team. I have not found anything I dislike so far. Messages tailored to specific groups. Quick way to alert all people about outages. We have every group/building in our organization mapped as a 'recipient group' ready when we need to address only a specific group of people. Being able to group IP phones with legacy speakers enable us to reach out areas where speakers coverage is poor. The software is great, but I do have to say that I really enjoy the customer service. You are always more than likely to get a friendly employee on the line who can help you woud with most if not all of your needs. If they are not able to answer your right away, they are dedicated to getting you a solution. To be honest, I cannot say I have any dislikes at this point. Everything works as it should. Get it and you will not be dissapointed. There customer service is top notch. Mass notifications for crisis alerts and paging has been our biggest uses of Informacast so far. Having this keeps everyone connected and alerted. "Informacast provides flexibility and functionality that's easy to implement and use. " I work for a school district where this was already in place before my arrival. I have also worked previously at other districts as a contractor where this system was in place. It's paired with IP Speakers and IP Phones. It works *BEST* if you already have a Cisco Call Manager environment. From basic one way announcements (either to one room, or to a whole building), to two way intercoms (typically done only on an individual room basis, but there is a way to configure small groups in a PTT environment using your Cisco IP Phones), for your passing period bells, and much more. Singlewire as worked closely with Cisco to provide even deeper functionality and abilities, that, of course, comes with a cost. I believe the Informacast Advanced system (which is better than the paging basic that comes with Call Manager these days), but is not their top of the line tier, is reasonably priced. If you have a deeper budget and haven't yet invested significantly into your various incident response plans, they have some incredibly deep functionality that pairs with things like Cisco Spark, to give you a very robust incident response. While we don't use this deeper functionality, knowing that it's there gives us an option to consider exploring it in the future if the need arises. This is not necessarily all on Informacast. It's another product on the network, it's another thing going thru the network. The way that we primarily use it, is in a method called "live broadcast" which means it's a multicast audio stream to all of the endpoints that were configured to get the message. We encountered a really weird issue where some random endpoints would "tune in" late to the stream. At one point their default configuration was to use a single multicast port for all traffic and just use different "passwords" for each stream. This seemed to cause problems in our environment, once Informacast support provided a configuration change that allowed Informacast to use multiple ports, one for each individual stream, the issue apparently resolved itself. I recommend going with Advanced Network Design IP Speakers, they seem to have the best relationship in terms of compatibility and ease of configuration. People tend to be sensitive to audio at different frequency ranges if you can find a way to create oscillating bell tones thru different frequencies it might function better. Most people remember those analog paging systems. Well, this is the digital replacement for that legacy system. BTW, Informacast offers solutions to integrate with those existing speaker deployments if you didn't want to wholesale replace them with IP Speaker/Clocks. Schools have been needing something like this for years, I don't think anyone needs to explain why this is just the "new and improved" version of that tech. With many more options above and beyond just a basic paging/intercom system. "Easy to use, powerful application"
Vendor sold us Informacast and deployed at a branch office. Did a basic deployment just to do overhead paging through IP speakers and Cisco phone system. I, unfortunately, didn't get to work much on implementation. When it came time to deploy at our HQ, learning the software could not have gone any easier. Intuitive, simple, powerful interface. Implementation at the HQ was done in a few hours after mapping what speakers were mounted where. Solution has been rock solid at HQ. documentation was somewhat fuzzy. Especially when it came to utilizing the paging gateway device. We have a branch that would not allow us to pass multicast traffic. Once configured and setup though its been pretty solid. We added new buildings to our branch and HQ campuses and it was time to dump the old analog paging system. Wanted something easy to use, manage ourselves, easily expand/subtract reach, etc. Informacast has fit the bill, and i know we aren't even tapped into all it can offer. "Informacast fills a void that Cisco left open in CUCM"
The Informacast paging gateways allow me to add paging through the phones at any VoIP deployment site that requires that option without having to resort to overhead speakers or installing any additional infrastructure. They are very easy to set up and offer many more functions than I even use. The best part though is their tech support. The tech support people are very knowledgeable, friendly and you can actually get them on the phone. I appreciate that. The version I have has a couple of bugs in it, but the only real issue I have had is when the paging gateway picked up a new DHCP IP address and the paging server couldn't communicate with it. This is what you are looking for. Get it. The Informacast paging gateways allow me to add paging through the phones at any VoIP deployment site that requires that option without having to resort to overhead speakers or installing any additional infrastructure. They are very easy to set up and offer many more functions than I even use. "Amazing Support for an Amazing Product"
Currently we are using the desktop notifier for emergency situations as well as we are using it for 911 notification to certain phones in our district when there is a 911 call placed. We are now realizing the paging feature as well as linking the system to IP clocks to display messages. The extreme flexibility that InformaCast offers. If you can imagine it, you can make it happen with InformaCast. Support through InformaCast is very good also - always prompt and helpful. Certain functions seem "hacked in". For example, the Desktop Notifier works great, but computers show up as IP speakers. Do the leg work to figure out exactly how InformaCast will be used in your environment, and then customize it to meet your needs. Our hospital is working to reduce noise in patient care areas to promote a relaxing, healing environment for patients. One way we're doing this is by using InformaCast to reduce our reliance on overhead paging. Love the automated weather alerting. We are able to automatically send severe weather alerts directly to our users desktop phones. The ability to monitor and alert safety staff of 911 calls is great feature as well. So many possibilities and uses, Choosing which ones to implement first was a challenge. Try it out. Get the demo and take it for a test spin. You won't be disappointed. Their support is top notch and very helpful as well. Peace of mind knowing that employees are promptly notified of weather emergencies without any human intervention necessary. "Great IP Paging System and Support"
Currently deployed over our VOIP solution and was very straightforward to use , able to send messages and efficiently communicate with users on campus. The user support is excellent with the staff more than willing to walk you through every step of the process. Everything works as expected, no issues in using the application thus far. Good solution backed by very helpful and responsive support team. "We upgraded from v8.1 to 11.0.5 - 113 & I'm absolutely loving the new InformaCast! #TheRaMethod"
The new GUI & UX is substantially improved. Management over broadcast groups could not be easier. In our previous Version 8.1, it was difficult to figure out how it all works; however in the new Version 11.0.5 - 113, It's just as easy as drag & drop... Update your CUCM with all appropriate devices & parties, go into IC, edit groups, click update, transfer the MACs to that broadcast group & you're done, easy peasy!!! It took me a minute to troubleshoot a couple issues (all internal infrastructure inconsistencies & nothing to do with IC; however, despite this, the vendor provided superb phone support during the process). You also have to ensure that the person/device that is broadcasting is part of the recipient group of that broadcast... Otherwise, it still works, but it just beeps & flashes the EBS alert on the display. Once you add that user to the group, you can 'push to talk' & actually page PA style from that persons device. This wasn't readily apparently; but quickly resolved. I also disliked how you had to click 'update' for IC to find new CUCM phones. I felt like the integration of this piece alone should negate the necessity to click an update button. That being said, it is just one simple click & takes no time to complete the task... You just need to remember to do it! Tight integration with CUCM, ease of use, pretty interface & satisfying UX.... Unless your pre-reqs include something that IC doesn't provide, I would highly recommend giving it a chance. Since we upgraded our phone system from CUCM v7..1 to v11, we needed to bring all other components up to snuff. This included (but wasn't limited to: our Publisher, Subscriber, VoiceMail & ultimately Informacast. We had Informacast before, but after our CUCM upgrade broke it. We needed to get it back because it is our enterprise solution for PA via Cisco phones & IP speakers on-site. Users & admins have commented that the UX feels faster & less clunky. Can the audio sound sharper on v11.0.5? I don't know, but I've been told that the broadcasts sound more crisp & lively, even through the IP speakers that have experienced issues in sound quality in the past. Ultimately, operators are much more comfortable using the service & increasingly promoting it's use. I like how easy he system is to use. The customer support team is also very knowledgeable. I dislike the time it takes to sync with call manager. The initial configuration of this system is difficult. But, once its configured it runs like a champ. Also, the support response time could be better. Once you get a technician though they are very good at resolving issues quickly. More User friendly implementation documentation and make finding this documentation easier. We are using this system for an IP based PA system. I tell people "You can do anything with informacast". The software package they provide literally has everything you could think when it comes mass campus communication. I have never seen such a scalable product with so many awesome features. The interface is very simple yet powerful. I feel better knowing our administration can instantly put our campuses in emergency mode with 2 seconds phone call and a canned message. I wish you could limit staff to certain ring lists and not give them full control of all campuses. Support is very helpful and they are a good tool to use once you have started implementation. I also found getting extra licensing is helpful as you start adding many endpoints once you start seeing the capability. We have many analog bell systems that are showing their age. Moving to IP will let us compartmentalize our system and just replace speakers. We are had great success with our Cisco IP phone system implementation and informacast can do the same for our many bell systems. Informacast is very easy to use. As long as the infrastructure and configuration is sound its pretty much plug and play. Very efficient and rarely have any issues. The way the paging gateways are configured. This could be simplified a bit, setting a static IP on one is a bit of a chore and requires you to use a Linux console. I would like to see the ability to telnet to these devices. This is a great product, I have looked into utilizing a router to page to phones and this is 100x easier. We have implemented this at several remote sites, by using the phones for paging instead of overhead speakers it is allowing us to reach areas where existing speakers do not. I like being able to tie in overhead speakers with the phones. "Singlewire in a K-12 Environment"
I like the integration with our existing Cisco VoIP implementation. We are able to execute paging through phones and overhead speakers from any VoIP phone. Also, we use it for our Bell system in most of our schools. We let the schools go in and control their Bell Schedules minimizing the need for intervention from the tech department. If I had to pick a something that I didn't like, is that I wished more 3rd party vendors supported Informacast! We are replacing old School Intercom/bell systems with InformaCast. This allows for less infrastructure. Less overhead management with a centralized system. And more control in the hands of my schools. "Easy way to extend the functionality of your VOIP system"
Informacast integrates with our Call Manager phone system easily and uses the Cisco IP Phones as speakers to make paging available around the office. The device discovery tool makes updating endpoints easy and quick. Being able to leverage existing technology and extending its functionality is a great way to reduce your administrative support and improve your ROI. Tying the system into Call Manager can be a bit tricky and upgrades to either system can break the service so you need to plan carefully. Since the product is not a native Cisco add-in, there's some technical challenge to those who may not have a full time Cisco admin on site. Before we switched over to a virtual appliance, we used an early version which ran on Windows Server. Nothing more needs to be said. Understand fully the environment you are deploying this tool into. Confirm with your Voice admin that the service is compatible. Go with the virtual appliance if you have the virtual infrastructure to support it. It's will require less maintenance and is almost a set it and forget it type system. The annual support costs is not high so keep that in place to get updates to the latest versions. Informacast will work with the latest version of Call Manager. We wanted to make office paging available to staff to announcement the start of meetings, calls on hold, and emergency evacuation drills. After we upgraded from Nortel to Cisco for VOIP, we lost the paging functionality. This was the way we brought that feature back. "Best fit for our Company"
Very versatile. Setup was fairly painless and SingleWire Academy is the best. Able to setup IP Speakers, Desktop Notification and Phone notifications very easy. And we are also using the InformaCast Mobile. Our Safety Team Chose this over other products as it was a more strait forward interface for them to use. After using InformaCast for the past few years we have been very pleased with it. adding Devices here and there their support always has the right answer to get you up and going quick. Still waiting for an improvement on the separating Desktop Notification from the IP Speakers. Find out exactly what hardware you need before you order hardware. What exactly do you need out of the system. Come up with a plan before you implement as you could be doing a lot of changing after it is setup. Have your Cisco CallManager Expert ready to help you with that side of things. if you have Cisco. We did not have a fire alarm for our building so this was much easier to wire and setup then a whole fire alarm system. And we can use it for more then just the Fire Alarm. We will be replacing our Desktop Notification (ReachPlus) hopefully soon with InformaCast. "Informacast - A vital part of our Emergency Preparedness Plan"
The ease of notifying our staff and teachers across the schools of emergency situations. Integration into our Cisco VoIP phone system. Alerts and reporting of incidents. I would like to see an OU structure for setting up and communicating to sites and departments. Informacast is highly recommended. I do suggest getting a vendor with experience and skills in setting up the product. Emergency Notification, Bells, and communication. It is simple to use and simple to understand. The web interface is clean and easy to use for both myself (an administrator) and for end users. The consolidation of messages, paging, and bell schedules makes notifications a breeze. Because it so heavily integrates with Cisco Unified Communications Manager, there's always the added complexity of diving into CUCM to get the integration to work. This isn't Singlewire's fault, of course, but it comes with the territory. Instead of calling a separate company to come and update bell schedules on legacy paging systems, we just do it ourselves in InformaCast. The ability to page from any room in our district, while still having it secured with a PIN, is invaluable. Zone paging at single site. Paging across to other locations. "InformaCast with Singlewire Paging Gateway"
This solution allowed to us Optimize our WAN by limiting multicasts from site to site. The combination of Server and Gateway is great! We can keep using our datacenter model for voice applications but still get the multicast service, like phone to phone paging. I personally like working with their tech support. Ive got a lot of really solide Linux guys on their staff. InformaCast does not offer any sort of extended hardware warranty. In an enterprise its hard to push paperwork through on orders, so it is challenging during break fix scenarios that I have no path other than a new sale to replace a broken piece of hardware. Overall though im still very satisfied with our engagement with InformaCast. I would recomnend this solution to anyone who is looking to expand their Cisco VoIP system features. Paging, Emergency Resonse and Intercom features are all expanded by this adjunct. We use the Singlewire Paging gateway that gives us some great flexibilty in our phone to phone paging. It allows our managers to send infomation to their teams in a quick manner without having to rely on passive media, like email. Very quick to grow and easy to administer solution. The single wire group has some of the best support structure that I've dealt with. Multicast is a nightmare to trouble shoot and I would prefer to have unicast solution. The paging gateway is a good start. 60 locations with up to 10 different zones of paging per location, Informacast is allowing clinic departments to alert patients, staff, and automated alerts. This is a very simple solution to administer as a single user can take care of this system along side a large phone system. Overall, the system has been extremely stable and its rare to have trouble reported due to a system issue. I can send text pages to desk phones so I don't have to interrupt everyone's work for things like planned outages. I like that there are many features and Plug-ins that will allow me to customize the system for my organization's needs. Informacast is a versatile solution and will be interesting to work with while the organization expands and adds more demands on its functionality. Some of the plug-ins are not simple to set up. Like the Inbound CAP plug-in. It took a long time to set up and I am still not sure it is set up correctly, even though I followed the instructions exactly as they were given on Singlewire's video instruction page. Get your staff who will be implementing and maintaining this software some training prior to go-live. If your IT infrastructure is something other than Cisco, like HP, and sub-netted, research your devices to see if they support PIM routing. If they do not, then you will either need to purchase additional gateways from singlewire or new switches that do support PIM routing. We had an old system that was not going to last and did not do what we can do, now. Before, everything had to be announced over the PA system and there was no separation, everyone heard all pages. Now, I can create paging zones and keep the noise down. "InformaCast - Safety Net For All Situations"
This product really brings the security of a building together. The ability to multicast out to the devices that were previously unable to be reached are now able to be interfaced. If multicast isn't available via the WAN to each building they have a solution for that so nothing is in the dark when it comes to sending out a message. When our customer's initiate a lockdown / lockout from their security system, InformaCast is notified via URL and then sends messages to all administrator's phones with both text and audio. The ability to also interface the bell system allows this same message for lockdown / lockout to be broadcast over the PA and inform students to get in the classrooms and await further instruction. InformaCast can then take a live/recorded message from an administrator via the phone system with further instructions. To be able to quickly deliver this information in an automated / semi-automated format is truly amazing and needed for the security and safety of our children. We no longer have to worry that the important notifications that are much needed for safety will be delayed or worse, never get to the ones that need it. Keep up the great work on your continuous development on integration. With partner's like Cisco, the money needed for development is always there. Nothing to dislike about 2 companies that are devoted to security. This product does a lot, more than you might ever use. The options are extensive. I would suggest using the product and going through all the options. Then streamline for your particular customer needs. 1) Lockdown / Lockout notification - through internal phone system, cell phones, email and PA system which was once impossible. "Singlewire InformaCast has provided our company an easy-to-use emergency notification solution." Singlewire provides fantastic DIY documentation for most if not all of their notification possibilities. I have been able to implement most of their solutions by myself. When I am unable to, contacting their support team is a breeze. They are responsive and ready to help with any issue you come across. Sometimes the DIY documentation I really like is missing a step or a little piece of information. Because of this, I have needed to contact support for simple problems that could have been solved through the documentation. They update their documentation, though, when this occurs. Also, I have had a few issues with their paging gateways. They seem to brick pretty easily and have just been a bit of a nuisance. If you have multiple sites, take into account the paging gateways. A paging gateway at each site is the best way to go. Figure out if a virtual or paging gateway is the idea. There seems to be ups and downs to both, but they are very important to utilize audio. The paging gateways have been our nuisance. 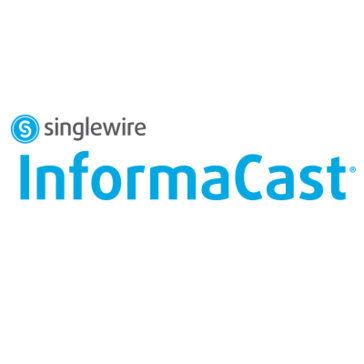 Singlewire InformaCast is supplementing our emergency and production line notification needs. We have realized benefits such as ease-of-use and customization. There seems to be nothing it cannot assist with. The biggest benefit we have realized are the automatic weather notifications. It automates a once manual process. The prime purpose of the product for two of our customers is to get information out to staff as quickly and easily as possible. The ease of use for the end users to send pre-canned/modified messages to staff is great. The end user only required a few minutes to learn the basic paging functionalities. We also have users restricted to certain messages and recipients to prevent erroneous pages. The product quickly grew to include weather alerts. The Reporting aspect needs to be improved. Users should be able to run more granular, customizable reports, and not have to be an administrator to run reports. This has been requested feature for some time, but has not to come fruition as of the 9.12 release. (Note version 11 has just been released, but I have not seen the newest features yet. Real-time alerting to staff members. "Information When You Need It"
The Informacast system is idiotproof. We have several buildings on campus and informacast makes it simple to alert all of our people in an emergency situation. The fact that it integrates with out legacy PA system is a plus. I cannot think of anything to dislike. It does what it says on the tin and much more. If you have a VOIP system, informacast is a great way to turn all of those phones into a PA system to get information out to all of your users. It is difficult to alert everyone on a sprawling campus of emergency situations. Bringing informacast in to our action plan helps with that. I like how easy the product is to use. Most of what I know about Informacast I have learned on my own. It also gives us the ability to put paging in smaller clinics. I don't like the upgrade path. The upgrades are hard to preform and we have had issues with them in the past. However I have heard this has improved recently. We use this product in our OR's to due automated paging. This allows nurses and OR Techs to press a button instead of having to do a live overhead page. "Using InformaCast with Speaker Endpoints Only (Bells)"
What I like best is that I can set up the ring list, schedule, exceptions, etc. and not think about it all year long. I love the ability to upload my own bell tones and got the idea from a colleague to have some fun on April Fools day with fun sounds! It takes some time to lear the ins and outs of setting up the schedule and scheduling announcements. With a CISCO VOIP phone system this would be seamless. We are without so it's a bit more of a challenge. Use this with a VOIP system. I am new to using the system and it is easy to learn and figure out even if you had no previous experience. Not sure there is enough logging of calls or alerts that go through the system. We use it to integrate into school PA systems and do alerting and bell schedules. The flexibility in dealing with devices and the ability to segment the devices into different groups would be nice, vs. always having to look a the whole group of devices everytime. I would recommend InformaCast and it works great with little Administration and their support is great. We are using this for paging and the problem is helped with is having a centrally managed paging system that can be used by multiple different offices and/or locations. Singlewire continues to improve their most important system InformCast. It has allowed me to leverage my phone system doubling it as a PA system which is critical for schools in lock-down drills! Ever since moving from a Windows platform to Linux, it has been super stable. Nothing to dislike at all. Maybe if there was a way to auto sync phones instead of manually. In an education environment, communication is utmost important especially for lock-down drills and other emergency-related events. "Very positive in all aspects "
I would like a more detailed training video for machine to machine integration. "Informacast provided unbeatable customer support "
Everything. Friendliness, attentiveness, level of expertise. "Excellent product with Excellent support"
Informacast makes it easy to integrate with an existing Cisco UC Cluster and build broadcasting messages to a group of phones. The installation package is a simple OVA that can be utilized on UCS infrastructure, has a small VM footprint and can be setup in less than a day. Configuration elements are easy to implement for the Cisco UC products. Lastly, and most importantly is the ease to access support team which provides excellent customer service through timely response. I will most certainty recommend to customers and business alike. IT is the product to consider for Cisco UC Environments. They have a great reputation as a cisco solutions part that integrates almost seamlessly. We use InformaCast in a K-12 setting, to inform users of emergency situations. We use InformaCast on Cisco phones, InformaCast Conference Call Plugin, and InformaCast Mobile. Support has always been knowledgeable, quick, and takes issues directly to the developers of the product. While the mobile platform is very new, it needs a little work to be integrated fully with InformaCast. There are workarounds available but it's not as seamless as we'd like. InformaCast has innovative plans coming, and genuinely listens to their customers' needs for development. Having all Senior Administrators auto-dialed by the Conference Call plugin, using our own Cisco phone system is invaluable. In an emergency, a Receptionist or Senior Administrator presses a button on their Cisco phone. This sounds an alert over the PA system and Cisco phones, auto dials a conference call to the Senior Administrators, and sends a message to mobile users, including a hard-of-hearing employee. "Amazing Product - Amazing Support"
The support team is outstanding - and the product never has an issue! Once the product is setup you will almost never need to touch it again. The system is just stable. We are finding new uses for the product, in education specifically that most people would have never thought of. That multicast is the only option for parts of the system. While it works great a unicast approach would allow for a better retro fit into older environments while the rest of the system can be upgraded. More integration into other systems and possibly a cloud approach would be nice but not sure how feasible that would be. Problems that we don't even know we have - fast communication from a single point. Makes everything simple! Many new uses for the program and broadcasting system integration are being found by our users because they see its great potential as well. "Easy to use fully customization experience." I like the user interface on both the mobile site and the administration site. They are easy to use and very robust. Some of the settings are a bit hidden and if you don't know what you are doing the consequences of sending out a false alert could be devastating. Mass notification for disasters and general alerting. "Great Product! Wonderful Support When Needed!" I like the simplicity of the interface, sending messages, creating groups of recipients is a breeze, and the support staff is great! I dislike the fact that Informacast's interface doesn't work with Google Chrome right now, also I feel that creating a custom ringtone could be a bit easier, having to use Audacity to create the file seems a little silly. While the initial setup does take some work if you intend to utilize the Legacy Paging Interface, only utilizing the phones is much faster, and the support you receive when preparing your Legacy Paging Interface was stellar. We are solving the issue of paging in our school district. We had an existing paging system that is aging and not very easy to use. The biggest benefit of the system is being able to send one message and have it broadcast through both the phones in the room and through our old system. Informacast provides a flexible and dynamic solution to add paging to Cisco phones, overhead paging to IP speakers, legacy overhead and more. It also allows you to configure items like Panic Buttons, Weather Alerts, 911 notification and more. The best thing is that Informacast's website and staff provide you all the tools you need to accomplish your goals with this system. The only thing that I don't like about Singlewire's Informacast is that it is a separate server but that isn't a big deal since it takes up few resources. Paging to Cisco phones and Weather/911 alerts are always needed and Informacast solves this every time. Ease of setup, intuitive menu options available, many options available for dynamic services. You won't regret implementing this product, it is worth the cost. "informacast one to many PTT with 7925"
PTT. the message sent via multicast. one to one and one to many. There was nothing to be disliked. it used the existing hardware and integrates it, unlike vocera badges, which need a separate hardware for similar functions. great support. fills in the gaps that CUCM could have with 7925s. i was resolving a tac case where the PTT call, both way was not working with Cisco's 5760 WLC setup. What i liked the most was support. The informacast engineer got on webex with me, helped me integrating it with our CUCM. The support was highly skilled and on the spot. "Great product, and great support"
The ability to tie into our Call Manager cluster has been essential. Confusing plug in configuration's or uses. This product has solved many issues with notifications for all staff, faculty, and police force. We set this up for alerting police for various issues, as well as configuring a lockdown procedure with various Cisco products. "Easy to use with no issues. " Ease of use. Fills all of our need for a paging system. We have experienced no issues with it to speak of. Have had good response from tech support for upgrades etc. Communication conduit for staff. Easy to get a hold of someone when away form their desk. * We monitor all InformaCast reviews to prevent fraudulent reviews and keep review quality high. We do not post reviews by company employees or direct competitors. Validated reviews require the user to submit a screenshot of the product containing their user ID, in order to verify a user is an actual user of the product. Hi there! Are you looking to implement a solution like InformaCast?